Faxonius luteus underwent a reclassification in August 2017, changing the genus of non-cave dwelling Orconectes to Faxonius. My heart stopped and dizziness overtook me. Lying on the floor, I screamed “NOOOO!! You can’t take my Orconectes! You CAN’T! I LOVE Orconectes. Why would you do that?” followed by a bout of pitiful sobbing. The crayfish formerly known as Orconectes marchandi, 9 June 2012, Martin Access, Warm Fork of the Spring River, Oregon County, Missouri. Similarly, the representatives of Orconectes form at least two distinct groups. The nominal group (the “cave Orconectes”) form a monophyletic group that is more closely related to members of Cambarus, while the remaining “Orconectes” are more closely related to Barbicambarus, Creaserinus, and other species of Cambarus (Crandall & Fitzpatrick, 1996; Fetzner, 1996). As the type species of Orconectes, Orconectes inermis (Cope, 1872), belongs to the cave-dwelling group, the genus is herein restricted to just those taxa. The surface-dwelling taxa now excluded from Orconectes sensu stricto are herein placed in the resurrected genus Faxonius Ortmann, 1905a, the oldest available name previously considered to be a synonym of Orconectes Cope, 1872. 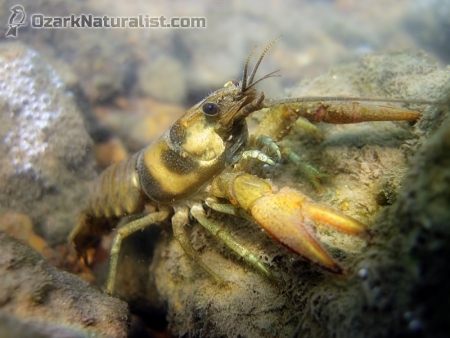 Doctors Crandall and De Grave did what scientists tend to do; they re-examined the relationship between crayfish species and then revised the taxonomy. Determining that the cave- and stream-dwelling Orconectes are not that closely related, they split them into separate genera. Because cave-obligate Orconectes inermis was the first species placed in the genus—separated from the genus Cambarus due to the absence of visual organs (also called “eyes” by the less sophisticated among us)—the cave-dwellers get to keep the name. Faxonius was the oldest name synonymous with Orconectes—I think it was first used in Ortmann, 1905—so the stream-dwellers were reassigned to a genus of that name. There is no shame in being a member of the genus Faxonius. It’s named for William Faxon, a prominent astacologist in the 19th and early 20th centuries, who contributed a number of crayfish-related papers to the literature. A man after my own heart, he was also an ornithologist of some note, the one who demonstrated that Brewster’s Warbler was a hybrid between Golden-winged and Blue-winged Warblers instead of a separate species. So I can’t argue that he is unworthy of a genus named after him. But Orconectes does have a certain je ne sais quoi that Faxonius lacks. Maybe it just rolls off the tongue more smoothly. Hell, I don’t know. My real problem, I suspect, is that I just don’t like change, period, and will resist it instinctively. Plus I have all of those damned files that will have to be renamed. Faxonius punctimanus, 21 July 2011, Current River @ Big Spring, Carter County, Missouri. Resistance, I hear, is futile, so I bow to the wisdom of the experts and accept Faxonius in lieu of Orconectes. But I don’t have to like it. Grumble, grumble, grumble. Cope, E.D. 1872. On the Wyandotte Cave and its fauna. American Naturalist, 6: 406–422. Crandall, K.A. & Fitzpatrick, J.F. Jr. 1996. Crayfish molecular systematics: Using a combination of procedures to estimate phylogeny. Systematic Biology, 45: 1–26. Fetzner, J.W. Jr. 1996. 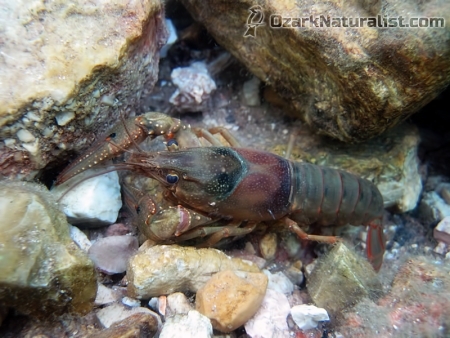 Biochemical systematics and evolution of the crayfish genus Orconectes (Decapoda: Cambaridae). Journal of Crustacean Biology, 16: 111–141. Ortmann, A.E. 1905. The mutual affinities of the species of the genus Cambarus, and their dispersal over the United States. Proceedings of the American Philosophical Society, 44: 91–136, pl. 3.